The feedback on my first Youtuber Swaps blog post was positive so I have decided to do another for the month of May. 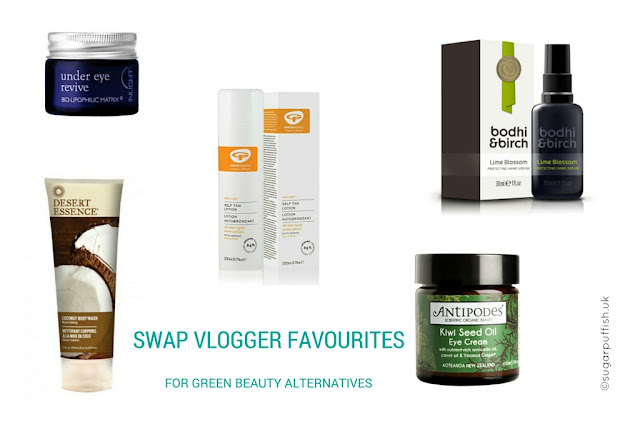 So lets get stuck in and I shall tell you my Green Beauty swaps for the following products. The Body Shop Pinita Colada Shower Gel - if you want to swap out Body Shop products there are two brands that spring to mind. I can't find an exact match for Pina Colada but Dessert Essence Coconut Body Wash and Lavera Exotic Body Wash are coconut scented so you still get that tropical holiday vibe. Estee Lauder Revitalizing Supreme Eye Cream - this one needs a luxury green beauty swap as the price tag is pretty steep. Try Antipodes Kiwi Seed Oil Eye Cream, Aurelia Probiotic Skincare Eye Revitalising Duo, Dr Hauschka Eye Revive, Estelle & Thild BioHydrate Refreshing Eye Gel and Inlight Under Eye Revive. Clarins Waterproof Eye Makeup Remover - with this one I immediately think of Bloom Remedies Eye Make Up Oil Cleanser, not only are the ingredients natural but it's far more affordable in comparison to Clarins. Laura Mercier almond coconut milk honey bath - lets ditch the honey element of this product and swap it for a Vegan alternative. I'm thinking Living Naturally Coconut Milk & Chai Bathtub Tea would make the perfect replacement. La Mer The Hand Treatment - there are lots of gorgeous natural hand creams and I could make suggestions for every budget however, given the product claims of Le Mer I think Bodhi & Birch Lime Blossom Protecting Hand Serum could easily match up to it.